Even if you’ve never practiced yoga, you’ve probably seen depictions of people sitting cross-legged, blissfully chanting. What are they doing, and why are they doing this? 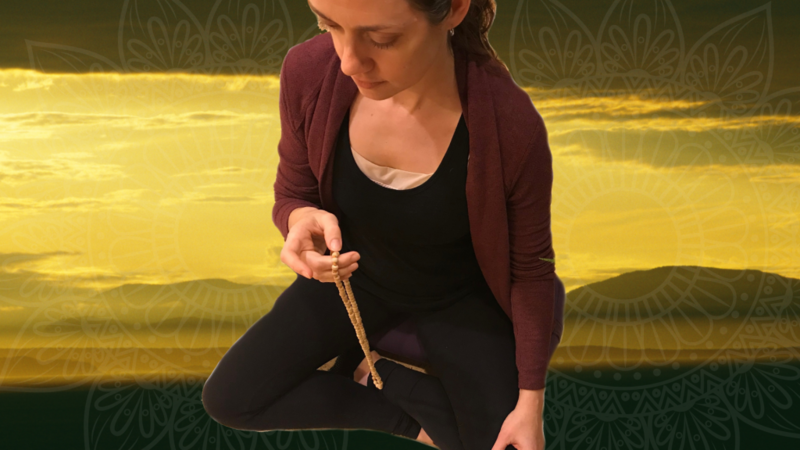 It’s not just for show; and while chanting can be thought of as “spiritual,” it’s not specifically “religious.” Indeed, there are very practical reasons why chanting can enhance a yoga or meditation practice. One literal translation of the word mantra is “to free the mind.” Mantra is a form of meditation known to relieve anxiety, depression, anger, and stress. Mantra can also open the 5th chakra (vishudda, or throat) as well as influencing the 4th chakra (anahata-heart). Our throat chakra is important as it promotes our ability to articulate our thoughts and feelings, communicate with others, express and release negative feelings, and increases our willingness to be truthful. It can be beneficial to repeat the mantra in Sanskrit; instead of focusing on the actual words, the mind can relax, even as the intention of the mantra seeps deep into our being. The Gayatri Mantra is one of the oldest and most sacred mantras. It predates Sanskrit and is Vedic in origin. The Gayatri Mantra is mentioned in both The Upanishads and The Bhagavad Gita, two important texts in the yoga scriptures. This mantra is an expression of gratitude and it’s focus is divine light, inner knowledge, and ultimately, self-realization. In this workshop, we will learn The Gayatri Mantra in Sanskrit, and repeat the mantra together 108 times. Cost: $15 walk-in; regular students may use their punch card! Read more about the benefits of chanting mantras here. This entry was posted in Publication, Yoga, Meditation and tagged meditation, yoga, amy prais, mantra, chanting, yoga chanting, gayatri. Bookmark the permalink.